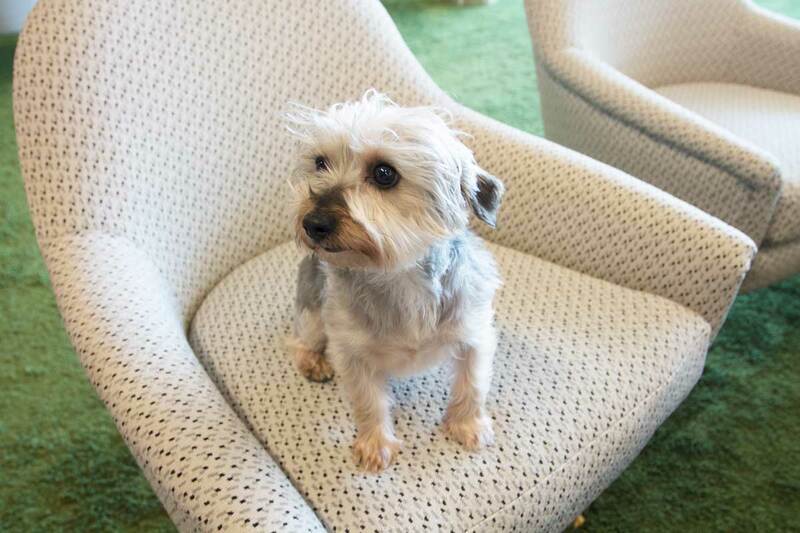 Around 400 staff members work at the company’s new Calgary office, which is filled with natural light, colourful furniture and roaming puppies. Where is it: 700, 611 Meredith Rd. N.E. For the past 10 years, Calgary-based company Benevity has been making it easier for companies to give back. Major corporations locally and around the world use Benevity’s software to manage their workplace giving, helping them and their employees support charities through donations and volunteering. “When our founders founded Benevity, they really saw the opportunity for corporations to play a bigger role in supporting charities. When they were starting out, a very small proportion of charitable donations were made through corporations. 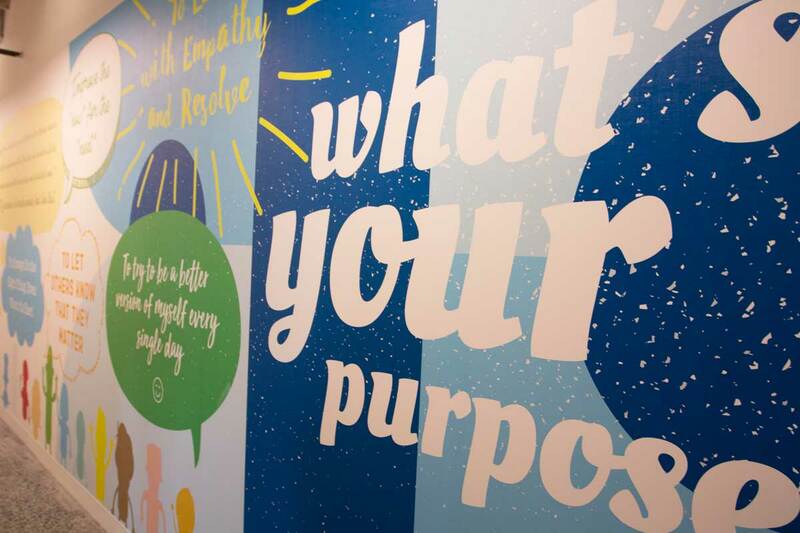 They saw that corporations wanted to be better corporate citizens, but weren’t quite sure how to do it and a little bit of guidance really helped,” says Anette Ceraficki, director of talent and people development. 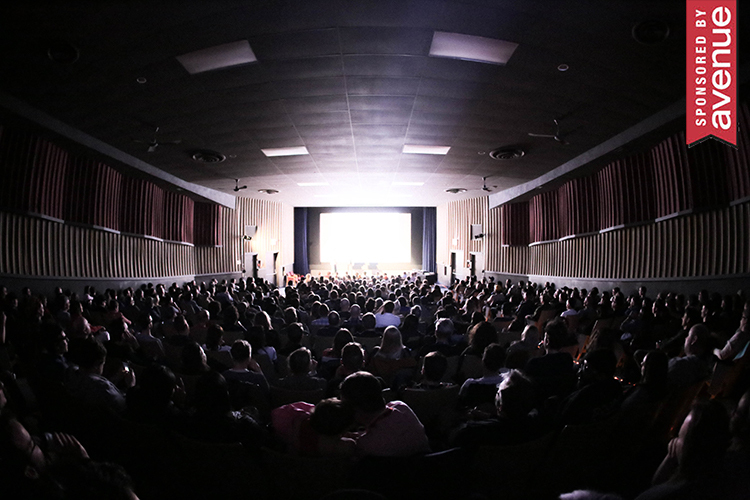 Benevity has seen some impressive growth in the last decade. 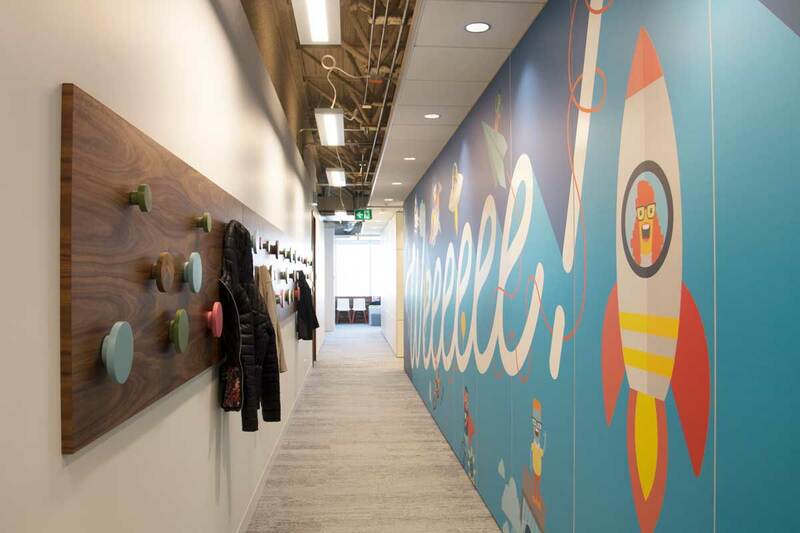 The company, which has additional offices in Victoria, Toronto, San Mateo and Gloucestershire, has grown from 70 total employees to almost 500 in the last three years. Around 400 of those employees work at the Calgary office, which has had to move to a bigger office space five times in the last 10 years. 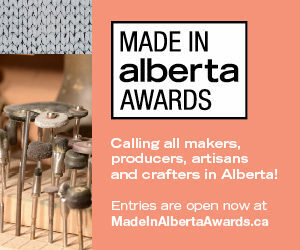 The company moved into its current Calgary office space in October 2017, taking over the seventh, sixth and fourth floors of an office building in Bridgeland. 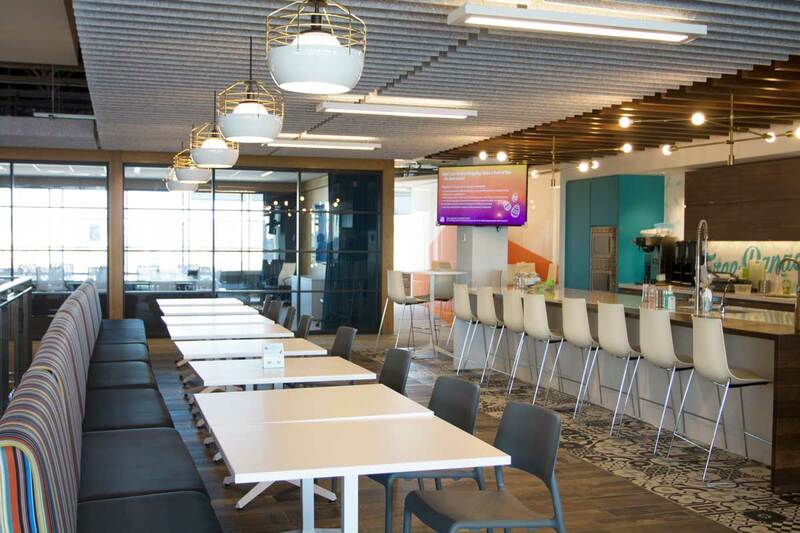 In preparation for the move, the company surveyed the staff to find out what was important to them in a new office space, and gave them a say on things like what kind of light fixtures and furniture would be used in their particular work areas. The goal, according to Ceraficki, was to create “a space where people could do their best work.” The final result is an open concept, light-filled office with colourful furniture, large murals and a collaborative atmosphere. Oh, and lots of puppies. 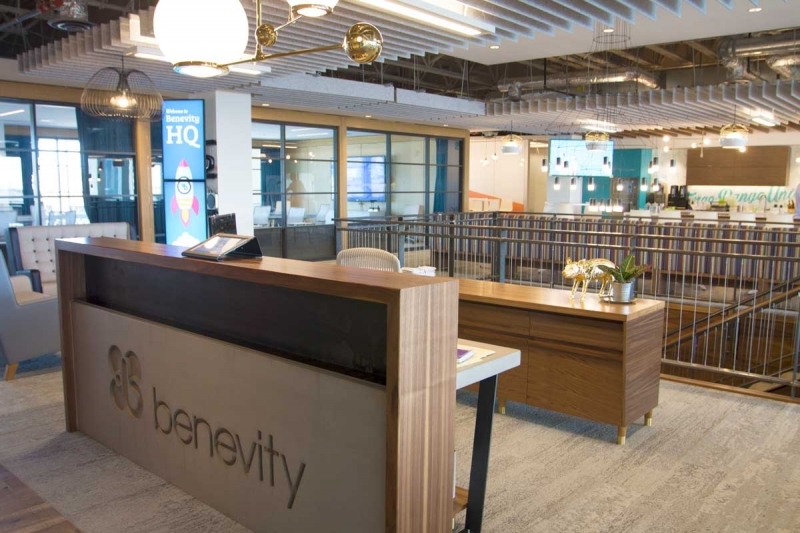 Benevity isn’t done growing either – the company is planning to take over the building’s fifth floor as well next year, and hopes to extend the internal stairwell they added between the seventh and sixth floor so that all four floors of the office will be connected. The open concept office features colourful seating areas, writeable wall surfaces and brick pony walls that pay tribute to Benevity’s previous office in downtown’s Pilkington building. Every week, the staff meets in this area (or video conference in from other offices) for a regular company update called TWeeTs (This Week Today). There is a kitchen and dining room area on each of the office’s three floors. The seventh floor dining area (pictured here) has a blue colour scheme, the sixth floor’s is red and the fourth floor’s is green. 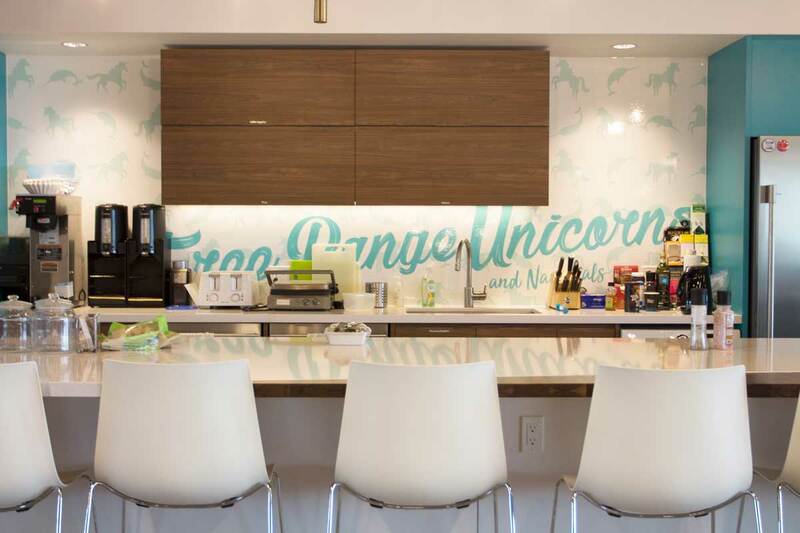 The company holds monthly food gatherings in the kitchens and every Friday, the staff come together for DevBeer in the sixth floor kitchen, which features SMEG fridges that get filled with beer. Benevity’s main boardroom can fit around 50 people in it. The custom marble table features mini individual microphones at each seat, which lie flat with the table until pushed on. This room is also sometimes used for yoga classes. 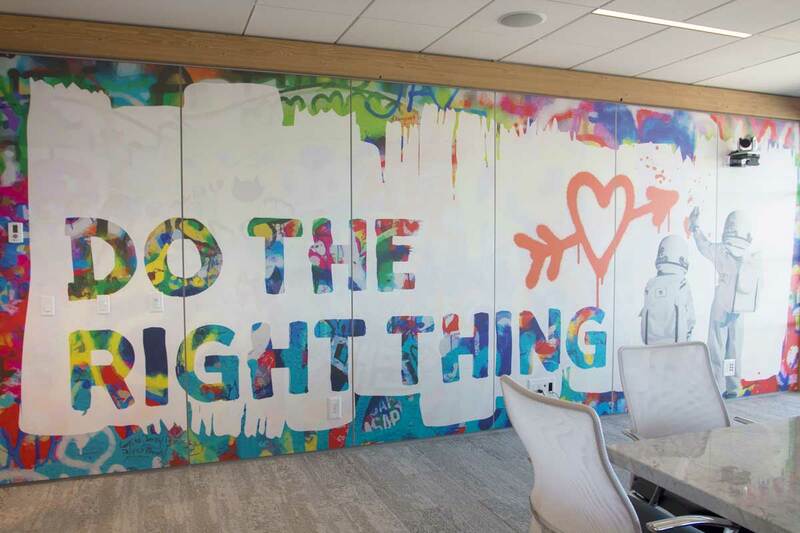 On the opposite wall of the main boardroom, the company’s main motto is featured on a colourful mural designed by the Benevity creative team. 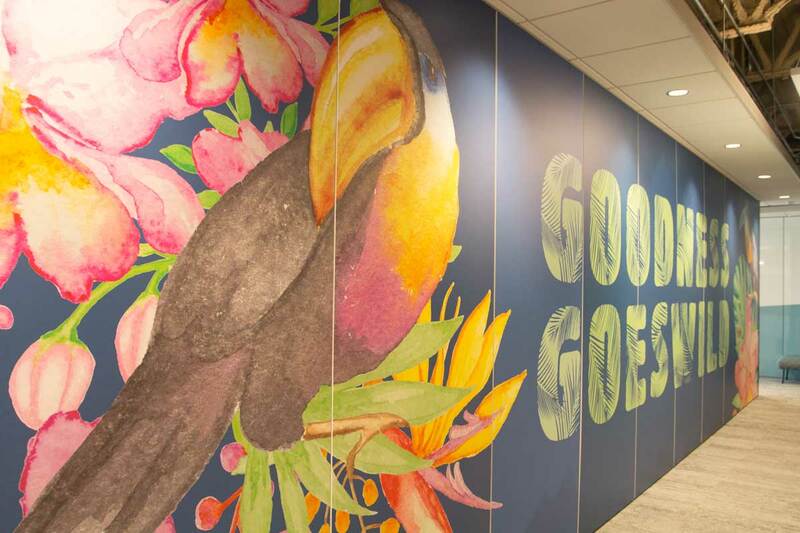 In total, the Benevity office features 19 colourful wall murals in areas like the hallways and the kitchens. They were designed by the Benevity creative team. VP People Vivian Farris says that for this particular mural, Benevity surveyed the staff to ask what their purpose was. Some of the answers, like to “Improve the ‘now’ for the ‘next,'” are featured in the mural. Some of the murals, like this space-themed one, face colourful coat racks that the staff use. When moving into the new office, one of the most important aspects was the layout of the space. All the desks were placed along the windows of the office so that everyone could enjoy the natural light, while meeting rooms were placed in the centre of the office. 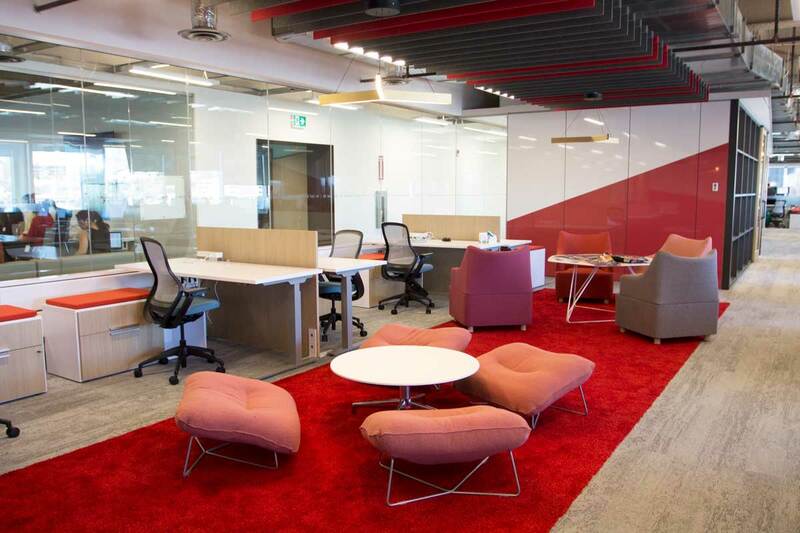 The open concept desk areas are decorated in different colours ranging from pink to red to purple, and everyone has a standing desk. The meeting rooms, which are located in the centre of the office, can feature lounge seating or a typical boardroom set up. 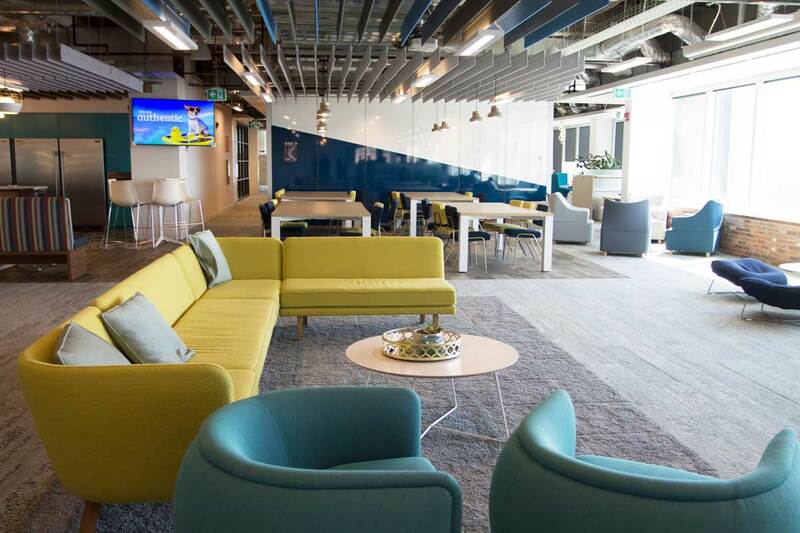 Each room has a unique name – think “Pilkington,” “Thumbs Up” or “Moon Shot” – that references things like the company’s history and culture. The meeting room windows are decorated with subtle word decals reflecting the company’s values and manifesto. 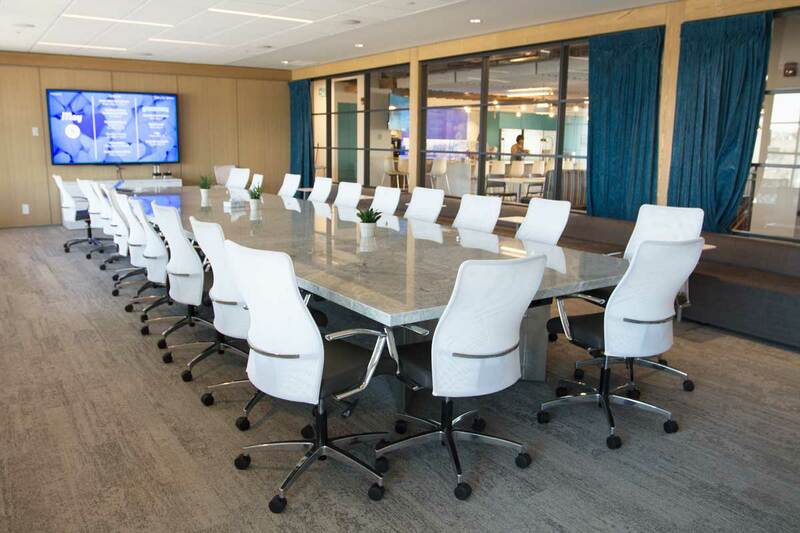 Since Benevity does have multiple offices around the world, the meeting rooms are also “zoom rooms” that allow them to easily connect with other colleagues by dialing them in or sharing screens. Colourful seating areas are spread throughout the office’s common areas and work stations so that staff can take a break or work away from their desk for awhile if needed. Since this is an open office, there are coloured felt panels along the ceiling to create a sound barrier, which helps keep noise levels down throughout the office. 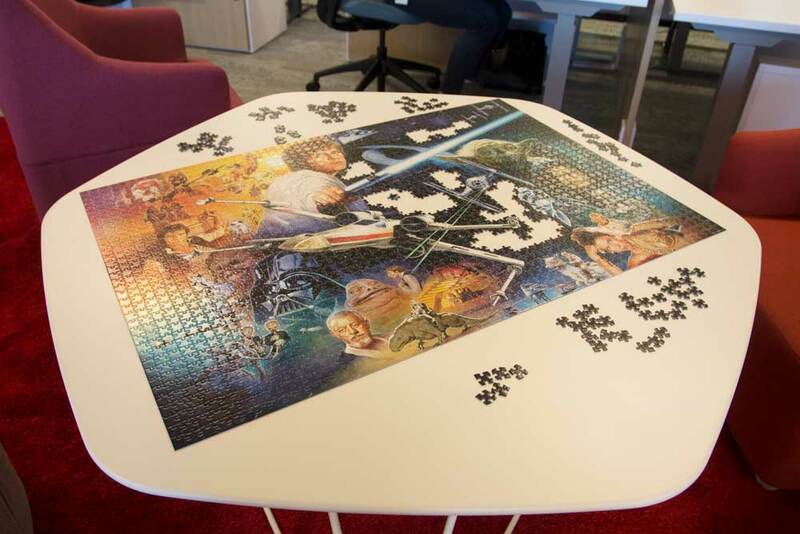 If employees need a break, they can play with the games and puzzles around the office. Someone had almost completed this Star Wars puzzle when we visited. This is the Branium Trainium & Learning Lounge. 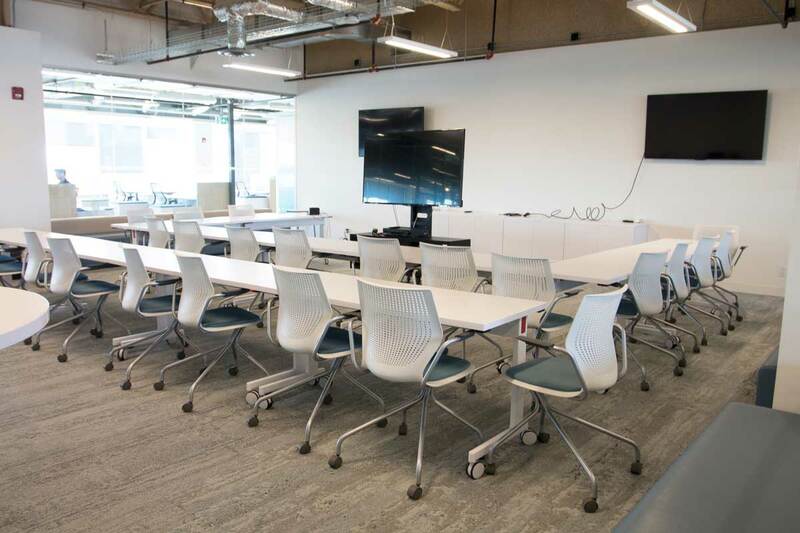 It’s used as a training room and a space where the company can hold learning sessions, such as for events like Operation Minerva. This is the Creative Station. 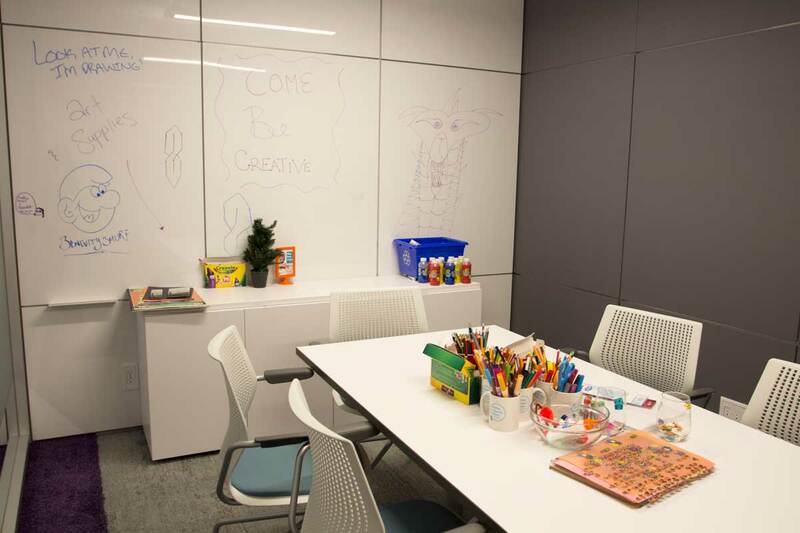 According to Farris, it can be used “whether you bring your kid to work one day cause they don’t have school or you just need to have kind of a creative break.” The staff have also used the room to do some volunteering of their own. 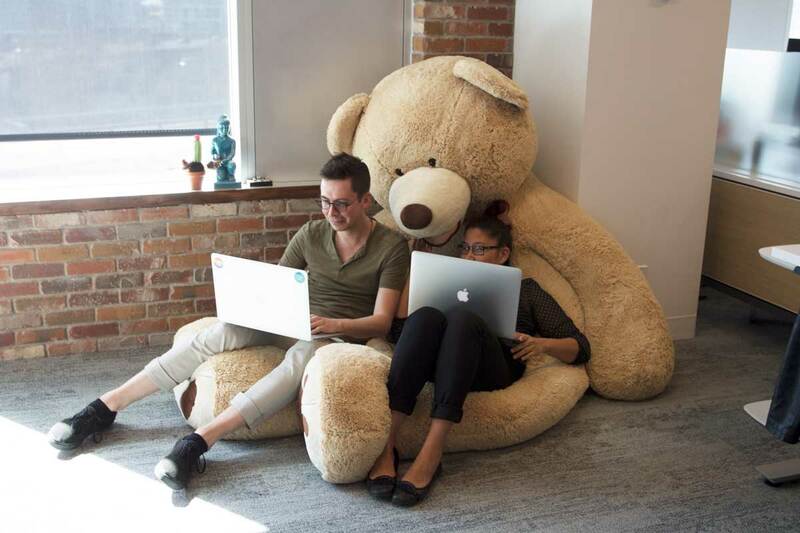 According to Farris, this 2.36-metre stuffed bear “just appeared one day” and tends to pop up in different places around the office. It’s also, as Client Services team members Bryce Kapsha and Jennifer Ming demonstrate here, a comfy work spot for the staff. 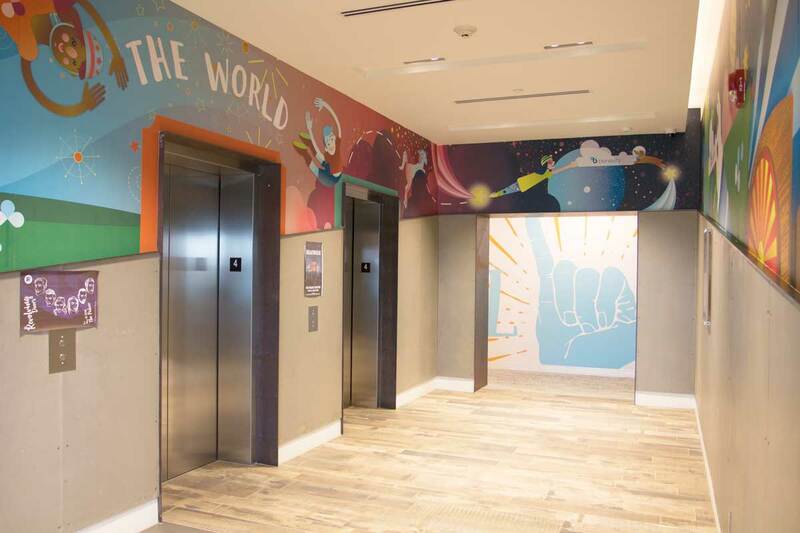 Even the elevator lobby areas feature artwork by Benevity’s creative team. The other elevator lobby on the sixth floor features narwhals and unicorns.